Thumb through any home decor magazine, and you’ll see a master bathroom with a soaker or shower as the showpiece. Ta-da! Homeowners, it turns out, are splurging to scrub up, according to the recently released U.S. Houzz Bathroom Trends Study. 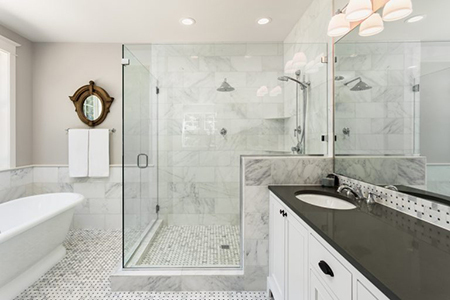 Ninety-one percent of homeowners in the study added a spacious shower to their master bathroom (after tearing out the tub), and many added on deluxe features, like a body sprayer or rainfall showerhead, for an improved, spa-like space. The average cost for a large-scale remodel of a master bath (sized over 100 square feet) was $21,000, shows the study. Master bath renovations cost more in pricey markets, however. In San Francisco, Calif., for example, a major remodel averages $34,100. Accompanying a luxury shower is a soothing gray and white color palette, according to the study. Nineteen percent of homeowners installed white countertops in the master bath, and 40 percent painted its walls white. Fourteen percent added gray cabinets, as well, to complete the tone-on-tone look. The majority of homeowners (90 percent) changed the overall style of the room, some to contemporary (25 percent), some to transitional (17 percent), and some, still, to modern (15 percent). As with other areas at home, homeowners are also integrating technology into their master baths. Atmospheric lighting, digital controls and smart toilets are all popular upgrades, shows the study. Bathrooms—master bathrooms, especially—are key at resale. The 2017 Cost vs. Value Report by Remodeling magazine estimates the resale value of a “mid-range” bath renovation at $12,024 (a 64.8 percent return on investment), and the resale value of an “upscale” bath renovation at $35,456 (a 59.1 percent return on investment). Beyond a master bath overhaul, another bathroom anywhere in the home can make homeowners happier with their house, a recent report by the National Association of REALTORS® (NAR) showed. A bathroom earned a perfect 10 “Joy Score” in the report.